This article explains how to create image content and add it to digital signage displays in ACES. The first step is creating your content (image) file on your local computer. This should be done by using the PowerPoint template provided to you in the digital signage drive under College of ACES\Shared\Templates. This .PPT file has different layouts you can use. If one of these layouts won't work for you please contact techsupport@aces.illinois.edu so a new template can be made that fits the current ACES branding scheme. Directions on how to connect to the signage drive can be found here. 1. Open the .ppt (PowerPoint) template file, select which slide layout (via "layouts" on the top menu) you'd like and then simply add content to the different regions. 2. When you're finished editing, save this file as a .pdf to the Digital Signage shared drive in your departmental folder. 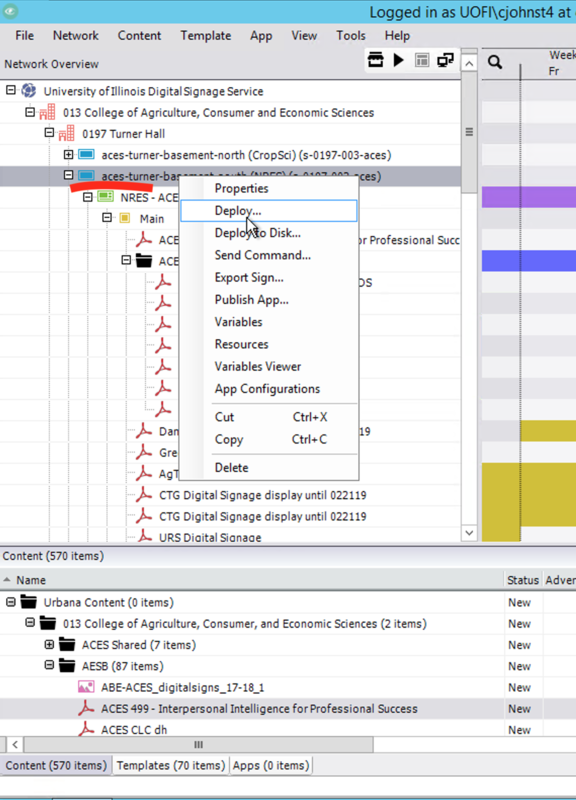 After you’ve saved your file to the drive, you'll then need to remote connect to Tech Services' FWi terminal to access the digital signage software, Content Manager. If you are unsure of how to do this, directions can be found here. 3. Open Content Manager. 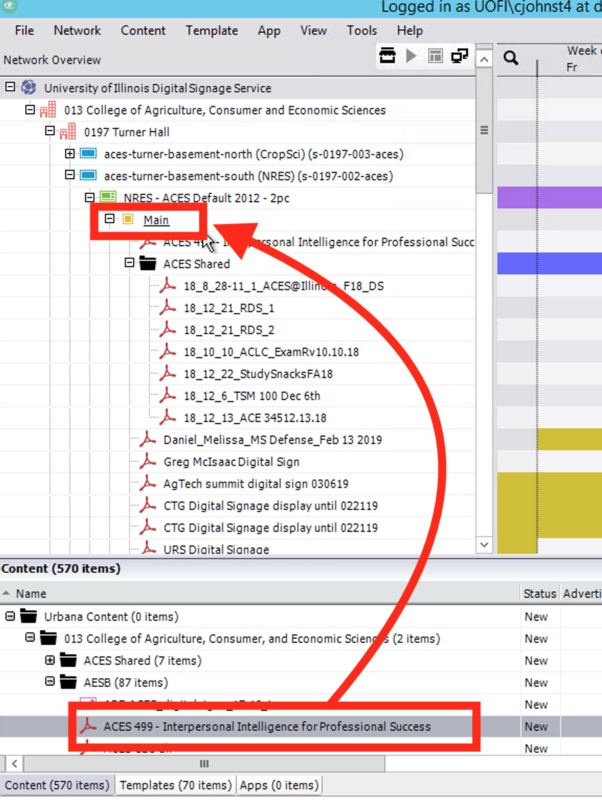 Once opened, look in the "Content" tab (lower left-hand section) and locate your department's folder. 4. Right click on this folder and select "New content in this category", and then select "Adobe PDF" (or whichever type of content it is). Start with number 1. (in red in the above image) which is URL information by clicking on the "3 dots" icon next to the text box. A second window will appear, which you will again need to click on the "3 dots icon" in the top right. On the next window that appears, you want to point to where this files lives on the shared signage drive. Once you've located your file, click "Open" and "OK" to get back to the above screen. For Duration: This is how long your content piece will be displayed before rotating on to the next content item in the same region. 30 seconds is the default and a good duration for most content items. If it is text-heavy, you may want to set the duration longer, however if there are several content slides on your sign, you might want to set duration to a lower number so the content is shuffled through quicker. 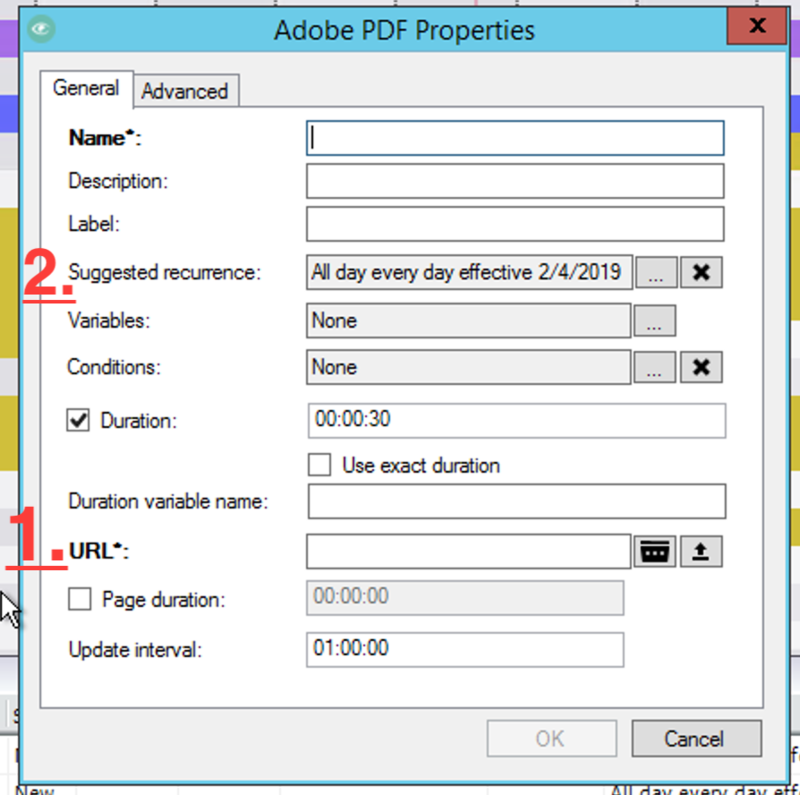 For Suggested Recurrence: This is where you can set your content item to only display at a certain time, start at a certain date/time, or end by a certain date/time. The default is to play the content all day, everyday. It's useful to change this, for example, when you have content about events and want the content to stop playing after the event has occurred. 6. Once everything has been filled out, click OK. Your content will now be available in FourWinds. 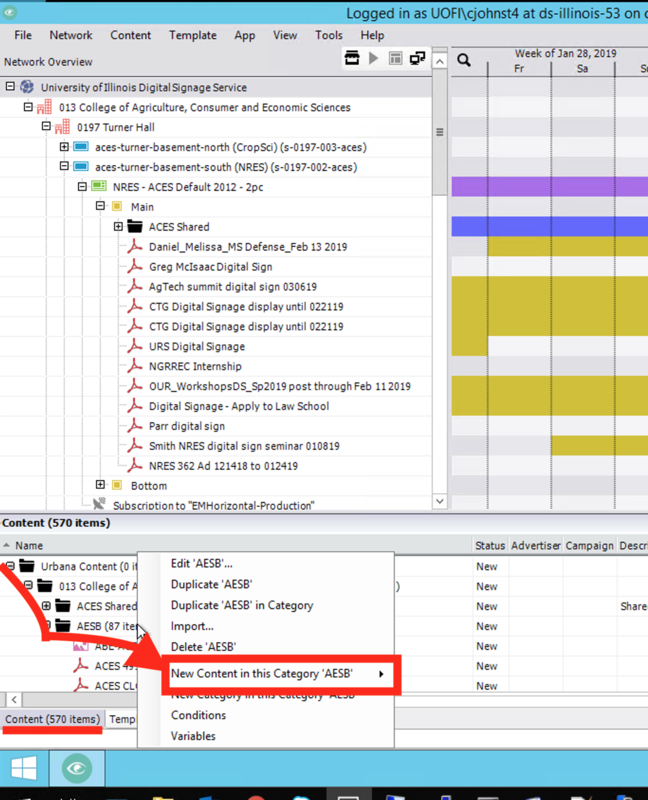 To locate it, click on the “Content” tab in the lower left hand corner of the program and select your department's content folder. If you don’t see your content immediately, you may need to click on the “Name” heading to alphabetize the content; brand new content usually appears at the bottom of the content list. 7. Once you have located your content, click on the content and drag it up to the appropriate region on your sign (usually "Main"). Make sure you are only dragging the content you want, it's easy to grab extra content you didn't mean to. 8. Once the content has been dragged to your sign's content region, right click on your sign and select deploy to deploy it to your sign. Doing so will copy these settings and files to your signage player and will display it as scheduled. NOTE: Hitting "Save" or "Refresh" will not update your sign; you must hit "Deploy" for any changes to take effect. Please remember: Be very careful when you click/drag. Do not delete any content unless you own it.